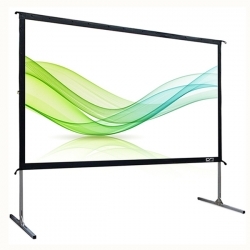 Manual Floor Pull Up Projection Screens use a telescoping support mechanism to set the height perfectly for you. Floor projection screens are lightweight and have all of the support you need built-in, so there is no messing with tripods or other elements that you have to keep and put up separately. 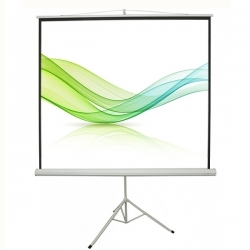 Portable pull up projection screen is the perfect companion for business presentations, classroom training, trade show, hospitality, a simple home theater or any portable application. Pull-up design sets-up in minutes. Scissor-back, cross spring support mechanism provides quick and easy pull up.Rotating feet supports add stability to elevated screen. Telescoping support mechanism provides a wide range of height settings and easy operation. floor pull-up design thats sets-up in minutes. Manually rise and lower the material from its rugged casing at your leisure. Manual Pull Up Projection Screen can offer you a perfect visual enjoyment with optimal image and colour reproduction. Screen Material: HD Matte White, Matte Grey, Fiberglass etc. Diagonal Size: 55", 60", 72", 84", 92", 100" or other size you may need. Cynthia Screen Floor Standing Projector Screen, Transportable Floor Scissor Pull Up Projection Screens 33" x 44"